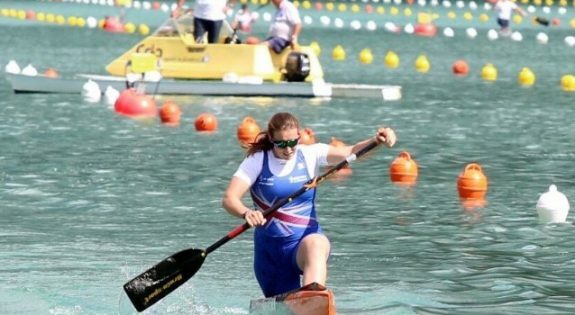 A Royal Naval Reservist, who also trains full-time as a civilian canoeist, has won a bronze medal at the European Canoe Championships. Officer Cadet Afton Fitzhenry serves as a reservist with HMS Sherwood, the East Midlands’ only Royal Naval Reserve (RNR) unit, joining the unit last year as she has always had an interest in both the Navy and sporting opportunities available through the military. 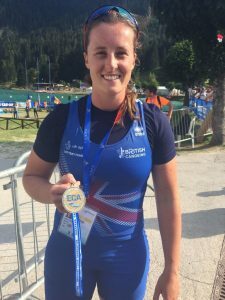 Explaining how she balances her two careers, Afton, aged 23, said: “I’m pretty busy as I train full-time for the British Canoe Team in Sprint competing all over the world in both general competitions and for the under 23s team. I’m also studying a part-time degree in mathematics and statics, but I still manage to squeeze in my RNR commitments as I’m passionate about developing myself in any way I can. HMS Sherwood is set to attend Nottingham’s Riverside Festival this year, one of the city’s biggest and most popular free festival events, and Afton is going to be Captain of the unit’s Dragon boat Team. She continued: “In the future with canoeing I hope to qualify for the next GB Team for the Olympic Games in Tokyo in 2020 and compete there if I can. I’d love to bring home a medal from the games, but I will have to wait and see. “When I was younger I was a Sea Cadet so I’ve always had an interest in the Navy. After this time I wanted to enjoy and experience opportunities that you can’t easily get in your civilian life, I feel very lucky to be able to have two careers I really enjoy. “I took part in the unit’s Freedom of the City of Nottingham Parade in June this year which I was extremely proud to be a part of. I am currently learning about the different specialist branches the RNR has to offer and am continuing to attend training sessions on a regular basis. HMS Sherwood is recruiting. No experience is required just an interest to learn new skills and the desire to undertake a new challenge. The unit is based in Nottingham but recruits from around the region. To find out more about joining please contact navymr-sherwooduwo@mod.uk or visit www.royalnavy.mod.uk for further information. “In the future with canoeing I hope to qualify for the next GB Team for the Olympic Games in Tokyo in 2020 and compete there if I can. I’d love to bring home a medal from the games, but I will have to wait and see."